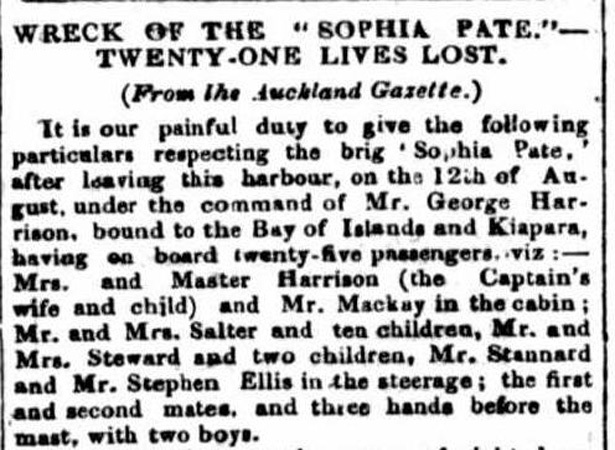 The fate of the brig Sophia Pate, wrecked on a sandbar at the entrance to Kaipara Harbour with the loss of 21 lives, highlighted the dangers of navigating New Zealand’s poorly charted coastal waters. The 165-ton Sophia Pate had been chartered by three Irish Wesleyan (Methodist) families to carry 23 settlers from Sydney, via Auckland, to the Kaipara district, where they planned to establish a settlement in the Kaihu Valley. Possessing three contradictory hydrographical charts of the Kaipara Harbour, the brig’s captain, George Harrison, scoured Auckland and Kororāreka (Russell) for a pilot familiar with the harbour entrance. When this effort was unsuccessful, he offered to refund part of the settlers’ charter fee if they agreed to travel overland from the Bay of Islands to Kaihu. Refusing the captain’s offer, 20 Irish immigrants stayed on board, along with the captain’s wife and son, 10 crew members and another passenger. Though Harrison waited for favourable weather and sailed cautiously along a charted channel near South Head, the Sophia Pate ran aground at 4 p.m. By 10 p.m. increasingly strong swells had broken the ship apart, destroyed the longboat and swept all but one of the immigrants, and the captain’s wife, overboard. At low water, about 3 a.m., Captain Harrison, his son, crew members and one passenger reached the shore in the ship’s jolly boat. Claims that Captain Harrison had prevented his wife and some of the passengers from boarding the jolly boat led to him being later detained in Auckland on a charge of manslaughter. The case was dismissed for lack of evidence, but Harrison was criticised for his ‘injudicious’ decision to enter such dangerous waters. We have 2 biographies, 8 articles, related to Wreck of the Sophia Pate.